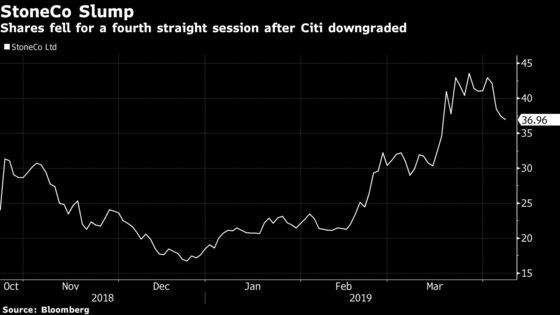 (Bloomberg) -- StoneCo, the financial technology company that has surged in 2019, fell on Friday after Citi downgraded the stock to neutral from buy, in part because of its recent advance. Shares of the Brazilian company -- which is backed by both Warren Buffett’s Berkshire Hathaway and Ant Financial, the Chinese financial services firm controlled by Jack Ma -- slid as much as 5.3 percent, though it subsequently pared that decline. The stock is on track for its fourth straight daily decline; however, this comes after a rally of nearly 100 percent thus far this year. The current valuation “already prices in most of the positive fundamentals for the next quarters, limiting further short-term re-rating,” analyst Felipe Salomao wrote to clients. He trimmed his adjusted earnings expectation for 2019, but raised his view for both 2020 and 2021. StoneCo “continues to offset competitive pressure with growth towards smaller clients,” he wrote. According to data compiled by Bloomberg, Berkshire is the third-largest shareholder of StoneCo, owning nearly 9.8 percent of the outstanding shares. Ant Financial owns roughly 2.9 percent. The company went public in October and has trended higher. Last month, it spiked following strong fourth-quarter results, the latest indication of strong growth trends. According to Bloomberg Intelligence, adoption of e-commerce in Latin America “can double by 2022, implying 21% compound annual growth.” StoneCo “continues to penetrate the market and gain market share via new offerings,” analyst Julie Chariell wrote earlier this week.